The Slaugham Archives - Shakespeare Society "Much Ado About Nothing"
Shakespeare Society "Much Ado About Nothing"
The WI Shakespeare Society brought “Much Ado About Nothing” to the stage in their last production before the war. Pictured above are: Miss Arnold “Don John”, Mrs Toogood “Conrade” Mrs Funnell “Borachio”, Mrs Sands (A sexton), Mrs Doggett “Dogberry”, Mrs Wilson “Verges”, Mrs Bartlett, Mrs Sayers, Unknown, Mrs Smith (Members of the Watch). This represents about one half of the cast list, but is the only photograph I can find of the production. 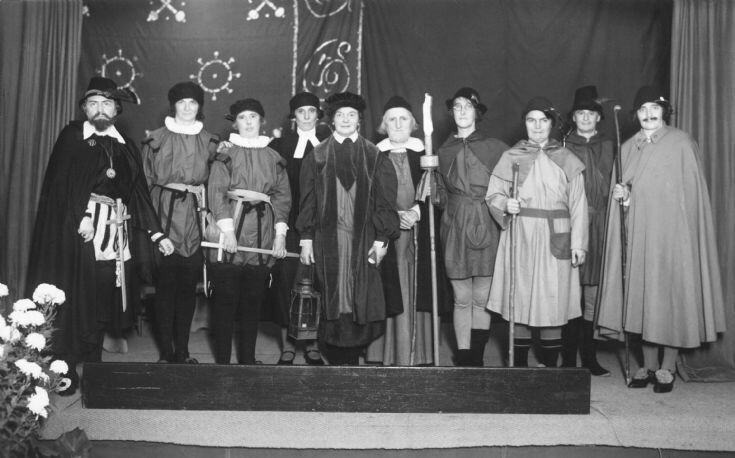 It is described as a “comedic play”, but the actors are depicted in a somewhat more serious mood here!